I was celebrating St. Patrick’s Day with my local Taiwanese friends, which, by the way, is a difficult holiday to explain for anyone not familiar with Catholicism and/or Irish culture. Where do you start? Explaining what saints are? Explaining the Irish immigrant experience to the U.S.? Explaining why it’s OK to pinch others in public? Or do you at some point you just give up and say it’s a celebration of green and/or of alcohol? You really start to realize how little you yourself know about this popular holiday. So you just end up ordering as much as you can off the special menu for the weekend– including some Irish stew, corned beef and potatoes, Jameson’s and Coke, and Bailey’s and milk. That last one was a bit inspiring– after all, it’s been a while since I sampled some Bailey’s, and my friend’s specialty is in making Nai-lao, (奶酪, nǎilào) or a kind of Taiwanese milk pudding. So it’s only natural that we try to combine these two things together and see what happens! 2) Warm the milk over low heat, and dissolve the sugar. Keep stirring to take care not to scald the milk, about 2 minutes. 3) Remove the pan from heat. Squeeze out any excess water from the softened gelatin, and add it to the milk. Stir until the gelatin is dissolved. Add the cream, Bailey’s, and vanilla. 4) Pour the mixture into single-serving dessert bowls; there should be enough for 6 – 8 servings, depending on how much you want to divide it. Another idea? martini glasses, similarly shallow cocktail glasses, or even highball glasses. My friend’s recommendation is to remove any bubbles from the surface by using a small spoon to scoop them away, for better presentation later. 5) Chill the nai-lao in the refrigerator for one hour or more, until the pudding is firm, of course. Keep them individually covered if preparing the day ahead. 1) Melt the butter in a tiny saucepan, using low heat and avoiding browning. 2) Add the cocoa powder, whisking quickly. 3) Add the cream, then the sugars and salt, continually whisking. Occasionally remove from heat if needed, but otherwise keep heating/stirring until the sugars are dissolved completely, about 2 minutes. 4) Transfer to a cream server or small bowl. Let the sauce cool to room temperature before putting on the chilled nai-lao. This was a wonderful dessert, with a sophisticated but simple taste. The richness of the chocolate sauce really enhances the milky flavor of the nai-lao. Actually, I think this version is a bit sweeter than the traditional Taiwanese dish, which is more about the coolness and texture than the sweetness, so i might be nice to try it with less sugar, maybe even as little as a couple teaspoons, just for a tinge. After doing a bit of research, I found out that the traditional way of making Nai-lao is to actually use a fermented rice wine from glutinous rice, resulting in more of sour taste. In fact, the Beijing version is also called 北京酸奶 or Beijing Suan-nai (Beijing Yoghurt.) So the results of this recipe, which represents more of a Taiwanese version, is sweet and milky, more like a flan. In fact, the Taiwanese version has many variations. You don’t often see chocolate sauce on it, but adding cocoa with the sugar you can make a chocolate nai-lao. The plain version is often topped with fruit or a brown sugar syrup (again, like a flan.) Following in the tradition of the former, I think having the Bailey’s version with some fresh strawberries, especially fresh strawberries in syrup, as topping would be amazing. As for varying this recipe, I’m already thinking about other cream-based liqueurs that could be added instead of the Bailey’s. Why not some Kahlua, or some Amarula? Perhaps crème de menthe, which with the chocolate sauce gives us a Grasshopper style nai-lao. Or 2 tablespoons of crème de cacao plus 2 tablespoons of cognac could give us a Nai-lao Alexander. Perhaps it doesn’t have to be creme-based at all, like adding some Amaretto, but for the texture you’d have to keep 2 cups of cream instead of the 1 3/4. 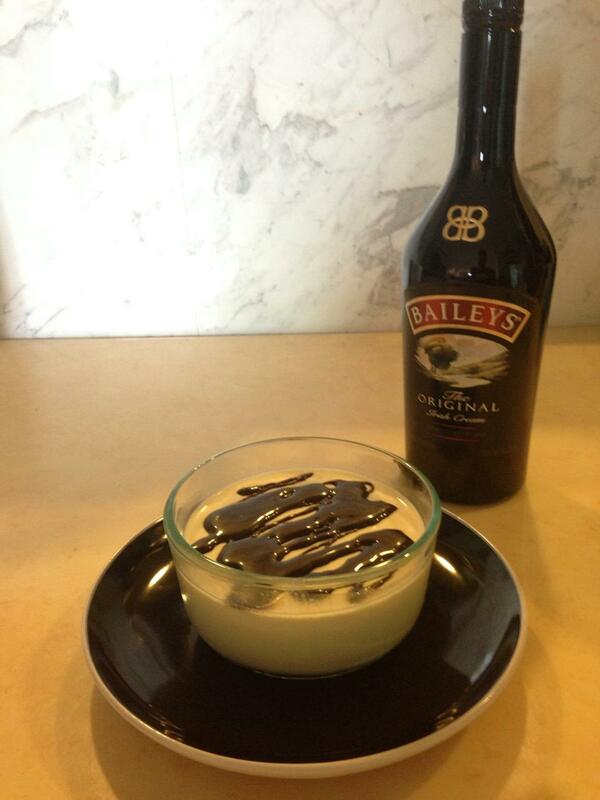 So there you have a new St. Patrick’s Day dessert, thanks to Taiwan. Try explaining that one to your guests at your next dinner party! To be honest I had a couple more posts ready to go, but I was very discouraged with the way the blog software here at WordPress seems to always transform my traditional Chinese characters (found in Taiwan) into simplified Chinese (somehow a default setting or something.) So what this means is that anytime I type in traditional Chinese, then post, it is without my permission converted into a different writing system. One of the things I hoped to do was post some things I found interesting as I continue studying Chinese. Now I’m not sure it really works. I love traditional Chinese writing (especially when opposed to the simplified version) and to not be able to use it is discouraging.